Amyris essential oil is distilled from the wood of the tropical evergreen Amyris tree found throughout the world. It often referred to as West Indian Sandalwood, though does not possess the same depth and character as true Sandalwood. Amyris offers a sweet-woody, balsamic aroma with good fixative value, and is often used as a substitute for Sandalwood when a less expensive alternative is required. Amyris relaxes and calms the mind, helping to alleviate stress and anxiety. It is also said to uplift the mood and it has an aphrodisiac-like effect when used in small amounts in a blend. Amyris is often used as an antiseptic, a sedative, and to improve circulation. It is very calming to the skin and the mind. "Both amyris oil and elemol were repellent to both species of ticks. Elemol did not differ significantly in effectiveness against A. americanum from the widely used repellent deet. At 2 and 4 h after application to filter paper, 827 microg amyris oil/cm(2) paper repelled 80 and 55%, respectively, of A. americanum nymphs. Ixodes scapularis was repelled by lower concentrations of amyris oil and elemol than A. americanum." I originally wanted sandalwood but couldn't afford it. After trying this. I was more than pleased. Thank you for the amazing oils JB! I wanted Sandlewood, but could not afford the “real” one. I read that Amaris could be used. It worked for me in my blend. Thanks for great oils. I don’t usually love the tree smells, but this is so delicate and soothing! Thanks Jade Bloom! It is a very viscous oil but I add with Cassia in my defuser and I like the smell. Rich and woodsy and perfect for meditation! I was anticipating a stronger smell, it's hardly detectable and fades away immediately. I won't buy this type again. I love this oil, I use it with Lavender, at night while sleeping. For me it work great. I'm glad I got this one free. It barely smells like anything. Great oil to have on hand! Wanted to get Sandlewood but it was way too expensive so decided to try Amyris. I have been very surprised and I like the smell. Not as strong as Sandlewood but I like it a lot. I was surprised at the aroma of this oil. hesitant after reading the reviews, sandalwood is a bit pricy and wanted something similar. And I was surprised when I smelled it how strong the musky woodsy refreshing smell was. Great buy for the price. Excellent scent. Very thick, thought It would smell like sandalwood but it doesn't. This oil is similar to sandalwood. It's nice. Not quite the same as sandalwood, but a good woody smell. It's not as strong as traditional Sandalwood but it's very lovely! Very nice oil. I don't find it to have the aroma of Sandalwood, but a slight vanilla scented wood that I find very calming. The scent lingers for quite a long time. I mix this oil with Cassia, it has a nice, pleasant smell. This oil is highly refreshing. I put this oil on my husbands lava beads and the scent has lasting longer than any of the others I put. very nice manly scent. Really beautiful and lasting scent! Thank you! This oil has a rich, woody fragrance that is soothing and enjoyable! I am glad I bought it! I love Sandalwood! I was hesitant to purchase this one, but I'm so glad I did. Yes, it's different, but it has that warm and earthy fragrance that lingers. Thank you! This is such a beautiful and delicate oil! We love diffusing it during our meditations. I use this oil as one of the main fragrances in a cologne EO blend for my fiancé. He uses it pretty much everyday. I also keep the bottle next to my bedside and put a couple drops on the bottoms of my feet to help me sleep. a friend of mine gave me this oil and I just couldn't be happier. it smells lovely, last long and fills my while house with a calming peaceful smell. I really do love this oil. I like the viscosity (very thick). I like the mild woody smell. I like that it’s saving Sandalwood trees. I also like the fixative properties for blending and the smoothing effects on the skin. I use sandal wood in my difusser for a calming effect. Good to blend with lavender to diffuse. This oil is great on your skin and a good substitute for sandalwood. Diffuse --4-Amyris, 3 Rom Cham, 2 Mandarin, 1 Valerian <--- can also be added to a massage oil or cream and rubbed on your chest, back and neck and arms. 3-Amyris, 3 Frankincense, 2 Bergamot and 1 Neroli, Lovely, uplifting. Hope you enjoy it as much as I do! Another great oil by JB! Another win for JB! Perfect addition to my skin care line. I add this into my skin care regimen. It is great to blend with ylang ylang , patchouli, egyptian geranium or Rose oil for your face and neck area at night. I also like to take a nice Epsom Salt bath with a couple drops of this along with lavender to calm a nervous stomach or tight neck and shoulders. I put this in my diffuser with some Sandalwood oil and it was ah-mazing! It is very calming and sedating, great for night-time. Need something to diffuse to relax you after a long day. After a long day I love to but this in the diffuser and Amyris will help you relax it reminds me of being camping in the woods and just relaxing It calms me down. After some days I need it alot. I got this oil as a free gift, but I would definitely buy it again! It is very relaxing and great for blends. This works great for anxiety! Very relaxing especially when mixed with lavender. I have never tried this oil until jade Bloom offered it free this last week and I love it my 5 year old sleeps so much better when this is defusing. I will most definitely ve buying this oil again. Wow! What a fabulous scent. Great price for a great oil. this is a must have. Just got mine in the mail..not an overpowering smell at all...this will work nice in my goldenrod salves. Only thing is...I really don't remember ordering this at all nor the Amla Fruit Oil??? I hope I don't start seeing this on a regular basis...I'll keep this one though. I got this oil through one of Jade Boom's many promotional deals. It smells wonderful! I like my regular Sandalwood too. This is just different. I like both. The price point for this oil is more affordable so it's more accessible to people which is a major plus! Really enjoy the scent, the hint of vanilla makes it very relaxing & calming, love diffusing this on stressful days. This oil is a very nice substitute for Indian sandalwood. I love it alone or with a touch of geranium and ylang ylang. Amyris is known as Poor Man's Sandalwood. If you love sandalwood but not the price tag (not much of a problem with Jade Bloom's awesome prices) this is the oil you want. I love the smell of this version of sandalwood. Although not as great as the real deal, it is a great substitute for it and smells nice. I can't wait til I can add the more expensive one to my collection! This oil has a very woodsy smell to me and is more manly. I think I'll make a deodorant for my husband with it. I thought it would have a floral scent to it as well but I don't smell that in it. I have been extremely pleased with every Jade Bloom oil I've purchased. This oil is no exception. I often use my oils in a diffuser, this oil has a nice light woodsy fragrance which is what I want when diffusing. COMPANY RESPONSE - March 2, 2017 9:22AM - Pat, we're sorry you didn't like Amyris. Please contact our support team and they'll be happy to issue you a full refund and pay your return shipping costs. 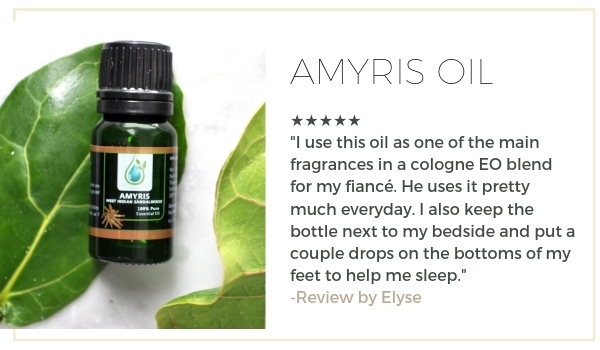 This Amyris oil has a beautiful subtle woody scent. Definitely a great base note. I love it! Overall still a great oil for the price, just disappointed in the aroma not being a typical sweet Sandlewood scent...I will purchase again at this price!! Still a great oil for the price with great overall benefits!! This is a thicker oil somewhat sticky, but because of the new droppers it comes out beautifully. It smells very softly of sandalwood, but is not nearly as potent as a sandalwoods blend (blend of different sandalwoods) I have from a different company. I would love to try the mysore from JB, but don't have it yet. This is a very pretty and soft scent, I'm just not sure how lasting it will be.